I have not had many regrets in my life. But one them? Discovering yoga so late in the game. Of course yoga has been around for thousands of years. But growing up in Maillardville in the 60s and 70s? I don't think any of us even knew what yoga was back then. Seriously. But thankfully I came to my senses about eight years ago when someone suggested I try yoga as another form of exercise when I was involved in my physiotherapist's '100 Day Challenge'. I attended a variety of classes and liked them well enough, but the choir belted out the Hallelujah Chorus the night I went to my first restorative yoga class! I leaned over and said to my friend, "I think have found my people." Meet Christy Defranco. I have been practicing with her for eight years now. She is a healer. She is a nurturer. Believe me when I say I feel like a 3 year old child when I am in her loving care. I could weep when she tucks me in with a blanket during shavasana at the end of class. Meet Annie Martinello. 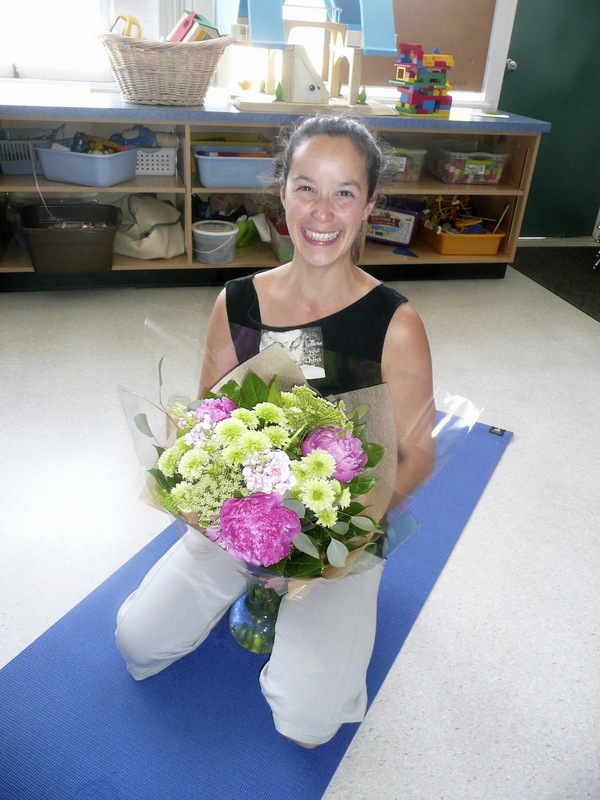 Annie comes to MY CLASSROOM to do a restorative yoga class with the primary teachers at my school. She, too, is a healer and a nurturer. This woman transports me to God-Knows-Where every time I am with her. I feel as if I'm floating far away listening to her soothing voice. Meet Kimberley Beck. Not only is Kim a yoga instructor, she is also a Thai massage practitioner. Kim has an aura of love and peace around her. She often pairs up with Christy to give 90 minute restorative classes with Thai massage mixed into it. And not only that! She will bring her mats, blankets and pillows right to your doorstep for a Thai massage at home! Trust me when I say it is a blissful experience. Yoga at the summit of the Sea-to-Sky gondola on the summer solstice. Last weekend I had the opportunity to participate in a yoga class to celebrate the longest day of the year. It was magical. Gazing out at Howe Sound while saluting the sun was breathtaking. And shavasana? It was heavenly laying bundled up on my mat staring at the sky watching puffy white clouds sailed overhead. I smiled about that experience for days. To me, yoga is medicine. It is a balm. It feeds my soul and my spirit. My dream is to go to a yoga class every single day of my life. Hopefully I can make this dream a reality when I retire in two years. I may have been late to the yoga party but I am going to make up for lost time.